Obtaining the "Europe Challenge Randonnèe" award means to have completed and be homologated on the 4 longest and most aspired Randonnèes of the European Continent, within a 4-year cycle. This first edition of the award goes to the randonneurs who have completed the 2015 ParisBrestParis - the 2016 1001MigliaItalia - the 2017 LondonEdindurghLondon and one between the MadridGijonMadrid and KölnBerlinHamburg on 2018. Congratulations on completing the great European Randonnée SLAM, the table below lists the cyclists who have achieved this aspired recognition. 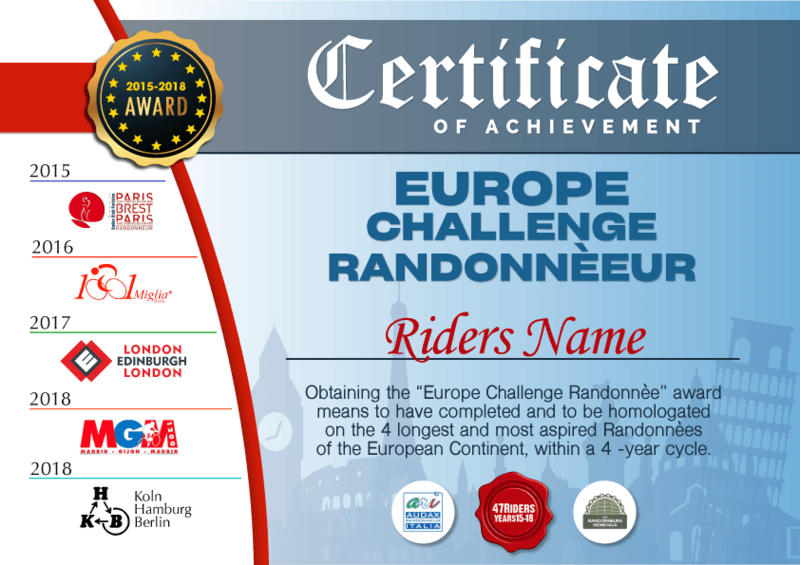 Here is the certificate of: EUROPE CHALLENGE RANDONNEUR, you will receive an email to your personal address, in which you will be asked to confirm the BRM codes obtained in the four randonnées disputed in the four-year period 2015-2018.